It was the quintessential Golden Age of Hollywood film: Lovable characters (yes, even the bad guys), catchy song-and-dance numbers, and a story that still makes audiences cry more than 75 years later after its initial release. The Wizard of Oz is an often-imitated but never-duplicated cinematic treasure (in this age of the multiple remake, that’s saying something) that remains an integral part of childhood seven decades after it first enchanted audiences in theaters. Many movies have tried to top that magical, life-changing moment when farm girl Dorothy Gale (a 16-year-old Judy Garland) opens the door to Munchkinland and trades her drab, sepia-toned Kansas life for one of boundless Oz Technicolor—and as of 2015 they still haven’t succeeded. But as with any other classic movie, The Wizard of Oz has its share of triumphs, tragedies, and trivia. Read on for some of our insights into this venerated Hollywood masterpiece. 1. YOU CAN THANK THE POWER OF TECHNICOLOR FOR DOROTHY’S RUBY SLIPPERS. More so than the braids, the toy Toto, or even the blue-and-white gingham dress, those sparkly ruby-red shoes are the key to any Dorothy Gale costume. But one of the most important images of the enduring Wizard of Oz mythos did not come from the mind of author L. Frank Baum, but instead from Oz screenwriter Noel Langley. In The Wonderful Wizard of Oz book series, Dorothy’s shoes were made of silver. However, Langley recommended the slippers be changed to ruby for the film due to the fact that the bright red hue would show up much better against the Technicolor yellow brick road. The silver shoes did make a comeback nearly 40 years later, when The Wiz was adapted for the big screen and Diana Ross’s Dorothy kicked it old-school for her Oz footwear. 2. GETTING DOROTHY HOME TO KANSAS WAS AN EASIER FEAT THAN MAINTAINING A DIRECTOR FOR THE WIZARD OF OZ. 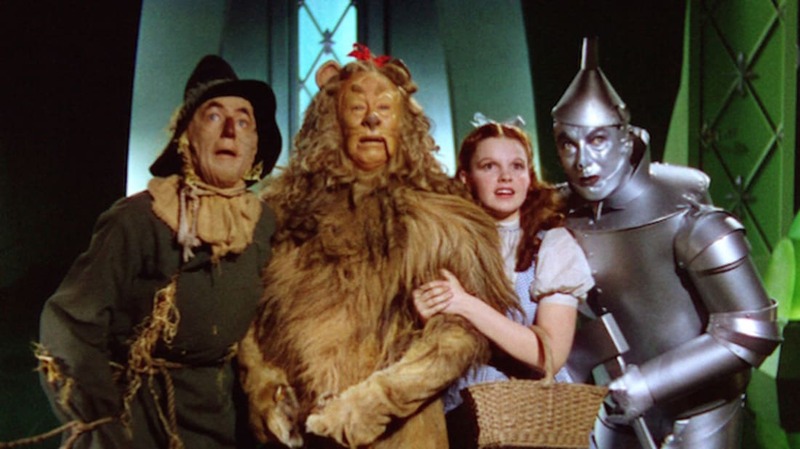 Victor Fleming may be the one officially credited onscreen, but The Wizard of Oz can boast four directors. The first, Richard Thorpe, was fired after less than two weeks. George Cukor was brought in next, but he was summoned away to go work on—of all projects!—Gone With the Wind. Then Fleming stepped in, until he too was called over to assist with Gone With the Wind, and King Vidor was hired to complete the movie. 3. RAY BOLGER, FOREVER IMMORTALIZED AS THE SCARECROW, WAS INITIALLY CAST AS THE TIN MAN. 4. ORIGINAL TIN MAN BUDDY EBSEN SUFFERED A SEVERE ALLERGIC REACTION TO THE ALUMINUM-POWDER MAKEUP, AND HAD TO BE REPLACED. Nine days into production on The Wizard of Oz, Ebsen found himself in the hospital, unable to breathe from the aluminum-powder makeup he wore as the Tin Man (cue the “Nice going, Bolger,” here). “My lungs were coated with that aluminum dust they had been powdering on my face,” Ebsen explained in the book The Making of The Wizard of Oz. The actor, who would go on to star in The Beverly Hillbillies TV show in the 1960s, was subsequently replaced by Jack Haley (whose Tin Man makeup was tweaked from a powder to a paste). Ebsen wasn’t the only one who had a near-fatal experience with his Oz cosmetics. Actress Margaret Hamilton, who played the green-skinned Wicked Witch of the West, suffered a second-degree burn on her face and a third-degree burn on her hand while filming her character’s dramatic, fiery exit from Munchkinland. Hamilton learned after the fact that her makeup was copper-based (read: toxic), and that if it hadn’t been removed immediately, she may not have lived to tell the tale. 5. JUDY GARLAND’S ORIGINAL DOROTHY LOOK WAS MUCH MORE HOLLYWOOD GLAMOUR GIRL. Judy Garland’s Dorothy will always be remembered for her simple farm-girl look (and the subtle Emerald City makeover later in the movie), but when production first began on Oz, Garland was given the traditional Hollywood treatment. That meant a bouncy, blonde wig and tons of makeup. Fortunately, for the film’s legacy, Glam Dorothy didn’t last long. It was interim director George Cukor who did away with the wig and cosmetics, turning Dorothy back into what she was all along: A girl from the Kansas prairie. 6. FRANK MORGAN PLAYED NOT ONE, NOT TWO, BUT FIVE CHARACTERS IN OZ. Most of the main actors in The Wizard of Oz played two roles: A Kansas character and his or her Oz counterpart. This meant Ray Bolger (Scarecrow), Jack Haley (Tin Man), and Bert Lahr (Cowardly Lion) doubled as farmhands, and Margaret Hamilton got wicked in both Kansas (Miss Gulch) and Oz (the Witch). But Frank Morgan, who portrayed the shady Professor Marvel in the Kansas scenes (and was only billed for that role in the credits), not only showed up in Oz as the Wizard, but also as the uppity Doorman to the Emerald City, the Horse-of-a-Different-Color-owning Cabbie, and the snippy (later, sobbing) Wizard’s Guard. 7. MARGARET HAMILTON ONCE APPEARED ON MISTER ROGERS’ NEIGHBORHOOD TO TALK ABOUT HER MOST FAMOUS ROLE. Hamilton discussed how kids could better sympathize with the Witch’s perspective by explaining her misunderstood nature: “She’s what we refer to as ‘frustrated.’ She’s very unhappy because she never gets what she wants.” (A prescient Hamilton was also hitting on the concept for the novel—and subsequent musical—Wicked here, 20 years before its publication.) The actress then ended her visit with Mr. Rogers in the coolest way possible: Dressing up in a Wicked Witch of the West costume (sans green makeup) and briefly slipping into her mischievous cackle. 8. THE CLASSIC 1939 MGM FILM WAS NOT THE FIRST CINEMATIC ADAPTATION OF L. FRANK BAUM’S NOVEL. Another silent film, also called The Wizard of Oz, was released in 1925 and featured a young Oliver Hardy in the role of the Tin Woodsman. It, too, deviated significantly from the book. 9. AT ONE TIME, DOROTHY, THE SCARECROW, THE TIN MAN, AND THE COWARDLY LION WERE DOING THE LATEST DANCE CRAZE OF 1939: THE JITTERBUG. But you never got to see it, because the entire sequence was cut from Oz for time (plus there’s the theory that producers felt inserting an up-to-the-minute dance craze would date the film). Right before the Wicked Witch’s Flying Monkeys descend upon Dorothy and her friends in the Haunted Forest, the group was supposed to be attacked by an insect (“The Jitterbug”) that would make them dance uncontrollably. In fact, at the start of the clip above, you can still hear the Witch comment to one of her monkeys, “I’ve sent a little insect on ahead to take the fight out of them” (continuity be damned). Full audio of the “Jitterbug” song still exists, as well as some very raw footage, both of which are available in the above clip. The “Jitterbug” song-and-dance number has also been reinstated in some stage versions of The Wizard of Oz (including a 1995 high school production that featured the writer of this piece). 10. TOTO THE DOG MADE MORE THAN THE MUNCHKIN ACTORS. Margaret Pellegrini, who portrayed one of the Munchkins in the film, said that she was paid $50 a week to work on Oz. In 1939, that was a decent wage for a working actor. Trouble was, Dorothy’s canine companion was pulling in a whopping $125 a week. That had to make things awkward on set. 11. AN IOWA NEWSPAPER ARTICLE SPUN THE WIZARD OF OZ AS A CURE FOR "WAR NERVES." One day after Germany invaded Poland (thus beginning the Second World War), Iowa’s Mason City Globe Gazette ran an article heralding The Wizard of Oz’s run at the local movie house. As a way to both increase morale and ticket sales, Oz was billed as the perfect escapist fantasy for those worried about the events overseas. The actual headline read: “War Nerves? See The Wizard of Oz for a Genuine Rest.” Glinda the Good Witch and her cohorts may not have been able to solve the problem of encroaching Nazism, but at least they provided a couple hours’ worth of comfort away from the horrors of the real world. 12. MOVIE-MUSICAL VIRTUOSO BUSBY BERKELEY CHOREOGRAPHED AN EXTENDED (AND DELETED) VERSION OF "IF I ONLY HAD A BRAIN." Another casualty of the cutting room floor, this extended “If I Only Had a Brain” sequence showcased Ray Bolger’s deft control over his seemingly elastic body. It is also extremely trippy and gave the Scarecrow the inexplicable ability to fly—which wasn’t going to gel with the rest of the movie (if the Scarecrow could fly, then why didn’t he go one-on-one with the Wicked Witch?). Luckily for Berkeley, the decision to delete this part of the scene in no way hurt the legendary director-choreographer’s place in the annals of movie musical history. 13. MARGARET HAMILTON USED TO SNEAK INTO BILLIE BURKE’S FIT-FOR-A-QUEEN (OR A GOOD WITCH) DRESSING ROOM. It’s not easy being green, as Margaret Hamilton can attest. The Wicked Witch actress’ sorry excuse for a dressing room was a canvas tent that, in Hamilton’s words, was “simply awful.” But Billie Burke, who portrayed Glinda the Good Witch, had her own thin slice of pink-and-blue-hued heaven on the MGM lot that was probably decorated by Glinda herself (in reality, Burke was the widow of vaudeville impresario Florenz Ziegfeld Jr. and knew a thing or two about glamorous living). “She had a pink and blue dressing room,” said Hamilton in The Making of The Wizard of Oz. “With pink and blue powder puffs and pink and blue bottles filled with powder and baby oil. And pink and blue peppermints.” So on days Burke wasn’t on set, Hamilton admitted to eating her lunch in her co-star’s palace-like inner sanctum. 14. AMERICA’S SWEETHEART AT THE TIME, SHIRLEY TEMPLE, WAS CONSIDERED FOR THE ROLE OF DOROTHY. At 10 years old, Shirley Temple fit the little-girl profile of Dorothy Gale much more than the teenaged Judy Garland. She was also a box office sensation who could guarantee packed movie houses. So it made good business sense that some of The Wizard of Oz's producers were considering the child star for the role. But the official reason for why Temple ultimately didn’t end up as Dorothy remains a part of Hollywood lore: it could have been because 20th Century Fox wouldn’t loan her to MGM for the film, or because Temple was supposedly part of an inter-studio trade with Clark Gable and Jean Harlow that fell through upon Harlow’s death in 1937. Also, while Temple may have charmed movie audiences with her cherubic renditions of “On the Good Ship Lollipop,” she didn’t stand a chance when going up against a vocal powerhouse like Garland. 15. VICTOR FLEMING SLAPPED JUDY GARLAND IN ORDER TO FINISH A SHOT. 16. JELL-O WAS THE SECRET INGREDIENT BEHIND THE HORSE OF A DIFFERENT COLOR. When Dorothy and her friends arrive in the Emerald City, they take a scenic tour around the fun-filled town courtesy of a cabbie and his Horse of a Different Color. In order to achieve the horse’s purple, then red, then yellow hue, the production team created a Jell-O-based tint that wouldn’t be harmful to the animals on set (yep, the ASPCA was involved). The gelatin powder worked wonders, except for the fact that the horses couldn’t stop licking its sugary sweetness off their coats! 17. THE WIZARD OF OZ HAS SEVERAL CONNECTIONS TO WALT DISNEY’S SNOW WHITE AND THE SEVEN DWARFS.